Getting Ahead for the Holidays - Join Us! Great idea! I’m curious about many of the recipes, but I’ve never heard of stuffing muffins before. My husband in particular is fond of stuffing.. Thanks! I am interested in your method for the make-ahead turkey. Make Ahead Turkey?? I got to see this one. Turkey! I would love to know how you do it! I’m looking forward to stir and pour dinner rolls! The stir and pour rolls!! Looking forward to this series Laura. Seems like the last few years I have pulled way back from all the holiday craziness and have simplified most of what we do…….so far, no one has complained. I think they are able to relax and enjoy the day even more. I love it since it has lessened clean up for me too! I just made a batch of your no knead cinnamon rolls for my son’s birthday breakfast. They were a big hit with his co workers…..none of them cook from scratch. They all think my daughter and I are amazing and have no clue how simple these recipes are. Shhhhh…….it’s our little secret! Ooops! I forgot to say stuffing muffins. I have a good recipe for sourdough stuffing that we like and I would like to try it in muffin form for packing in my boys lunches for work. Whipped sweet taters! Bring em on! I’d have to vote for the gravy actually. I can’t make gravy worth beans! All of them! If I have to prioritize, it would be whipped sweet taters – they are in season and my family has been eating LOTS of them lately – – so many, I’m concerned we might turn orange. Maybe I should have said green beans . . .
Stir and pour rolls!?! This I gotta see! The stuffing muffins look very interesting to me! It all sounds good, but I’m curious to see the stuffing muffins recipe. I *love* stuffing, but none of the rest of my people do. It sounds like it would be great for mini portions. I can’t wait to see the Stir-and-Pour Dinner Rolls recipe! I’m looking forward to the Apple Pie recipe. I made one last year and while it wasn’t bad it definitely wasn’t stupendous either, leaving much room for improvement. Definitely the green bean casserole because we usually only have that at Thanksgiving and Christmas! I am excited about all of the recipes but definitely interested in the green bean casserole. Love following your blog!!! I am excited about all of the recipes but definitely interested in the green bean casserole. Great idea! Green bean casserole sounds good! Why the stuffing muffins of course! My kids would love those all year! It all sounds like exactly what I need! The make-ahead turkey sounds wonderful. I was getting the usual dreading-the-holidays-because-of-all-I-have-to-do feeling when I read this post. Bless your heart, Laura! Make ahead turkey sounds great! The real food green bean casserole!! Can’t wait to see how you do it! I’d love to see the make-ahead turkey recipe. If that’s all done, my oven will be free enough to cook anything I want on Thanksgiving. What a concept! Most excited for real food green bean casserole! Make-ahead turkey and the stir and pour dinner rolls! You’re the best, Laura! I’m feeling a bit overwhelmed with all the work involved with the upcoming holidays. For starters, we have 30 people coming for Thanksgiving. Somehow it is up to me to make all of this happen. This post is most welcome, because it helps me to realize that I am not alone. 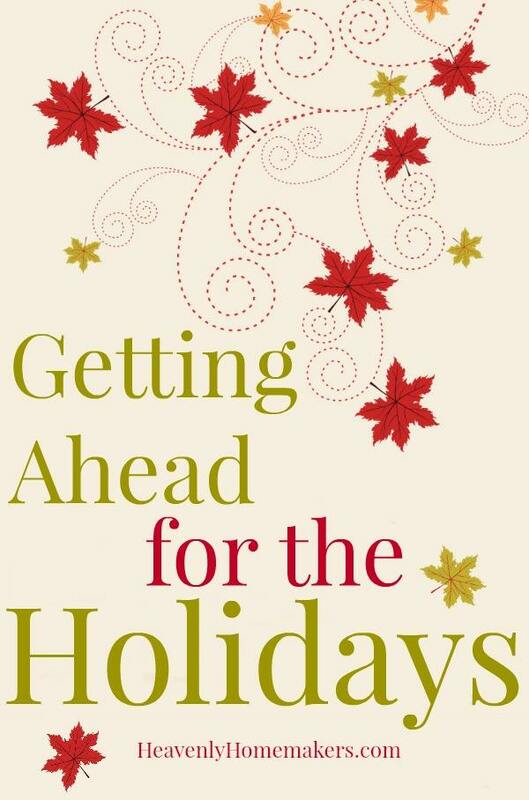 There are other women out there feeling the weight of responsibility regarding the holidays. I think I would most like to see the recipe for make ahead turkey first. I am always the one to bring green bean casserole, so I can’t wait to see the recipe you have! Hi Laura. I have had you and your make ahead turkey on my mind for a few weeks now. I am determined to do that one at least, and hopefully more. Thanks for all you do! I want to see the Make Ahead Turkey and Simple Stuffing Muffins. I am excited for all of it. I’ll need all the help I can get as I help my daughter go thru cancer treatments during this busy time. Thank you so much! I’d like good gravy and the green bean casserole. I’m assuming that the stir and pour dinner rolls is the newest trick with your stir and pour bread recipe. ???? Looking forward to the series of keeping it simple. It’s called the KISS method; keep it simple, sister (or sweetie or sir). I have to say I’m most excited for the Whipped Cream – I always make mine minutes before serving, since I don’t know how to keep it fluffy for even an hour or two. I’d love to know how! The stir & pour dinner rolls sound good and easy! Definitely the make-ahead turkey and stuffing muffins (never heard of those before). I’m excited to see all of them! But make ahead turkey & stuffing muffin’s look interesting! I’m intersted in the make ahead turkey. How do you keep it from drying out? Mine dries out easily after it’s stored. YAY!! Hooray for getting ahead!! I can’t wait to see stir and pour rolls and green bean casserole as those are 2 of the items I am in charge of for our family Thanksgiving celebration! Stir and pour rolls can’t wait. Your menu sounds great, and I’m really looking forward to all your getting ahead tips for the holiday. Thanksgiving is my absolute favorite holiday. I would vote for the Easy Stuffing Muffins because I’ve never heard of that before, and I’m curious to see what that is. Thanks so much for all you do! Anything make ahead is good but the make ahead turkey sounds like just my thing since I may need to roast 2 turkeys this yr so having 1 done already would be wonderful. I keep inviting more people when I find people who have no where to go. I’d love to see all of it! After 24 years of marriage and going to my parents’ every year, I will be doing my first thanksgiving this year :) I think the turkey recipe is one I’d like to see first! Thanks for the help! I want to see the mashed sweet potatoes! Oh Goodness! How to decide. I guess first it would be the turkey, then the whipping cream, then the gravy. The Real Food Green Bean Casserole definitely! Stir and poor dinner rolls! Yum!!! We use your one hour whole wheat roll recipe and love it. My 10 year old is a pro at making them. So, I’m very curious to see the stir and pour roll recipe. How does it compare to the one hour rolls? Make ahead mashed potatoes that actually turn out? yes please! I’m interested in seeing a real food version of green bean casserole. I’m interested in all the recipes, but especially the real food gravy recipe. Making gravy always makes me nervous about whether or not it will turn out. Your recipes are so reliable; I can’t wait to try your recipe for gravy! Looking forward to stuffing muffins, love stuffing from box but don’t love all the salt and unhealthy things that come with. Can’t wait for the green bean casserole & the dinner rolls. Thanks for all your work on the recipes & tips for the blog! Love your posts!! Stuffing muffins. My kids would go crazy! I’m looking forward to the make-ahead turkey. That will take a lot of pressure off to have that already done! Real Food Green Bean Casserole sounds amazing, as well as Stir and Pour Dinner Rolls! Stuffing Muffins – can’t wait!! And the Stir and Pour Rolls! Definitely easy stuffing muffins! It sounds genius, not to mention I wouldn’t have to buy stovetop! Stir and pour rolls. Gotta see that! And make ahead turkey… My oven every now and then gives and error message and needs rest and then works fine. In thinking about hosting Thanksgiving it occurred to me I should not cook everything on Thanksgiving Day! The “oven on strike” has been very rare but can’t risk it on Thanksgiving! I can’t wait for your whole series!! Stir-and-pour dinner rolls?!?! Yes, please!! Definitely the green bean casserole, because I’m hungry for it. But I am very curious about the make-ahead turkey… without drying out… that will be genius! All of them but the whipped sweet potatoes and make ahead turkey the most! I am looking forward to the pumpkin and apple pie recipes. I’m not a pie person but my husband loves them. Those two just happen to be his favorites! I’m excited for the stir and pour dinner rolls! I wonder what these stuffing muffins you mention are. Make ahead turkey, and stuffin muffins! The first thing that caught my attention was the stuffing muffins. I love stuffing (no matter where you stuff it!). That being said, it seems logical, though, to share the make-ahead turkey recipe. I learned to do this from my mother and aunts (all in Canada…maybe it’s more common there, or I just have smart relatives), long ago. I’ve actually made the turkey, stuffing, gravy, homemade cranberry sauce and pies or crisps ahead and frozen them all with success. It is DEFINITELY the way to go! I’m also interested in trying your pie recipes, as I also adore pie (my grandmother who just passed away at the age of 93), made THE HANDS-DOWN BEST fruit pies ever. Although I really enjoy baking, for some reason I’ve never mastered pie crust, and mostly shy away from baking this favorite. So I guess I’m just looking forward to the whole thing! Make Ahead Turkey? Really? Ok, I am in. Looking forward to this. The stuffing muffins sound interesting… and also the pineapple fluff. Can’t narrow it down to just one! My family thinks we must have Green Bean Casserole so I’m looking forward to your “real food” version. Everything sounds wonderfully good. Can’t wait to get started myself. But I do have a question–where’s the cranberry sauce? All that good stuff and no cranberry sauce!! How do you survive Thanksgiving? Follow the recipe on the bag and it is super easy, quick, and a whole lot better than the canned stuff. One can even use less sugar if they want to. Win. I’m most interested in the real food green bean casserole – my son LOVES it, but he’s gluten free. We have a recipe for making it that way, which works, but I’m always curious to see how others pull it together for new ideas! I would love to try the stir and pour dinner rolls. This sounds intriguing as I only know the knead and pound method. Is there a recipe to be found. Thank you kindly. .
I’m pretty excited about this series! We live overseas and usually try to invite other families living far away from their families over to our house for Thanksgiving. Sometimes this can be stressful! (Thankfully my husband helps!) Make-ahead sounds awesome! 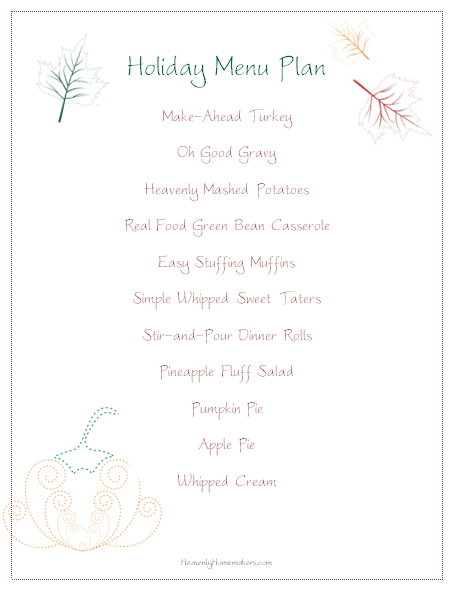 I’m excited to hear about the mashed potatoes, the turkey, the rolls, and the apple pie! I would especially like to hear about the stuffing muffins. There is just never enough stuffing in the turkey. Or if you have ham…. Sounds like something that would be good to have on hand for any other meals, too.